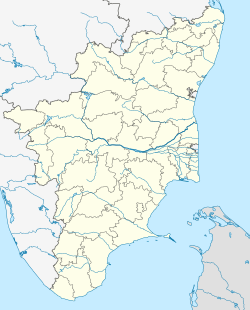 Aralvaimozhi (or Aramboly) is a panchayat town in Kanniyakumari District in the state of Tamil Nadu, India. It is a small town situated in southern India. Aralvaimozhi is an important mountain pass through the Western Ghats which leads to the West and many of the invasions faced by the Chera and the successor kingdoms came via the ghat. The name "Aral" was derived from the fort built and maintained by the rulers of Venad and later by the kingdom of Travancore to defend the kingdom from invasions from the east regions. The fort was captured by the English East India Company in 1809 from the soldiers loyal to Velu Thampi Dalawa. The remains of the fort can be seen near railway station; but neglected by both railway and archeology departments. Poigai Dam, the dam constructed in the year 2000 is serving water for irrigation purposes around the area. ^ "Tapping the Wind - India". February 2005. Archived from the original on 21 February 2007. Retrieved 28 October 2006. ^ Watts, Himangshu (11 November 2003). "Clean Energy Brings Windfall to Indian Village". Reuters News Service. Retrieved 28 October 2006. This page was last edited on 23 January 2019, at 02:26 (UTC).